As I wrote out my recipe, (Did you know most of my recipes have previously only been in my head? Whenever people use to ask me for recipes I always had to tell them next time I made it I’d write it down for them, ha!) I realized I made one mistake on the pantry list and left off a nut butter. What was I thinking?! I guess it sort of slipped my mind because it’s a staple in my home–literally we are never without it. 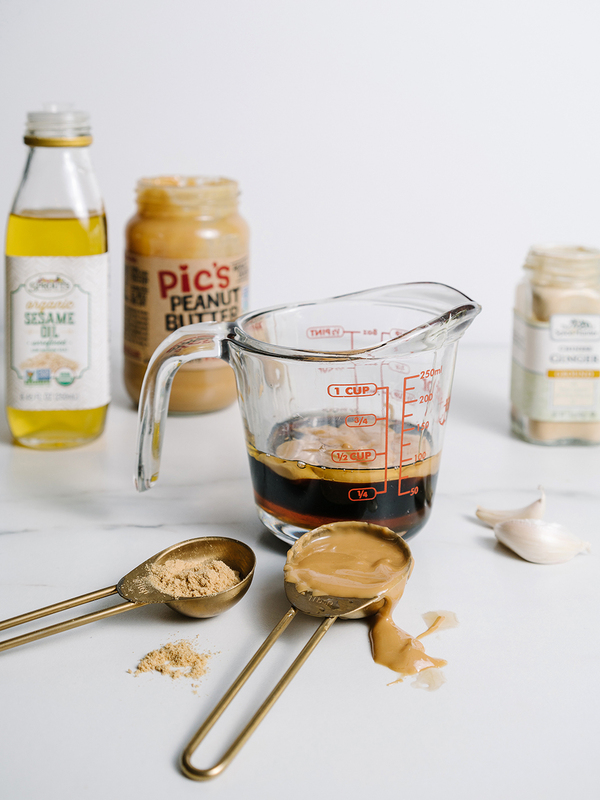 I am a nut butter freak, but particularly peanut butter and this peanut sauce is so good. Luckily, it’s also really good without! 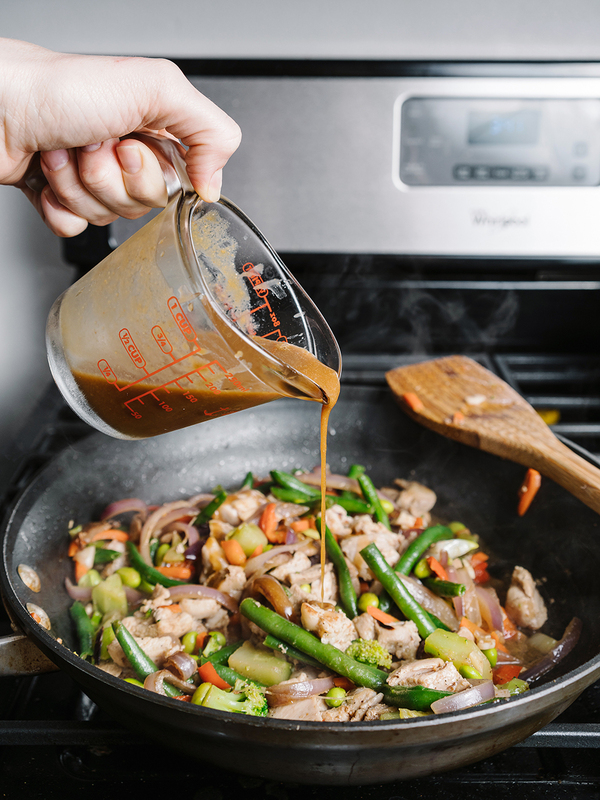 So, if you don’t have or want to use a nut butter, it’s more of a traditional teriyaki tasting sauce, still super delicious. 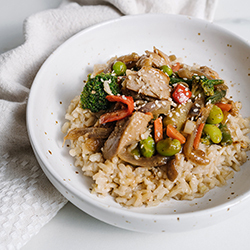 Part of our Pantry Capsule series, this super simple stir fry is full of flavor and can be a peanut sauce or a traditional style stir fry, plus offers the option of choosing your favorite protein. Gluten free, dairy free, vegetarian options. 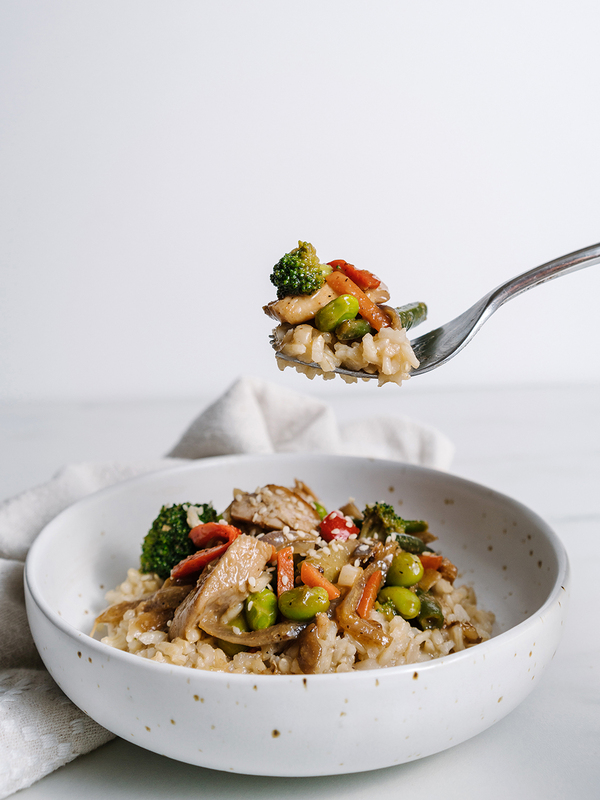 Cook rice or quinoa with broth or water. Measure sauce ingredients in a small bowl and whisk together, set aside. Heat a saute pan with oil on medium, add onions and saute until clear (about 3-4 minutes), then add protein and garlic, cook through. 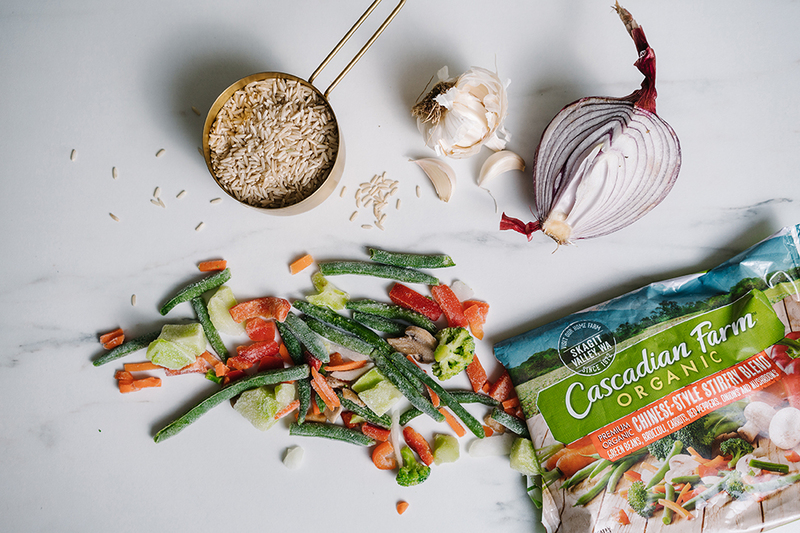 In the same pan add frozen veggies, spices, and salt and pepper and stir for 3 minutes, then pour sauce over mixture and stir for 2 more minutes. 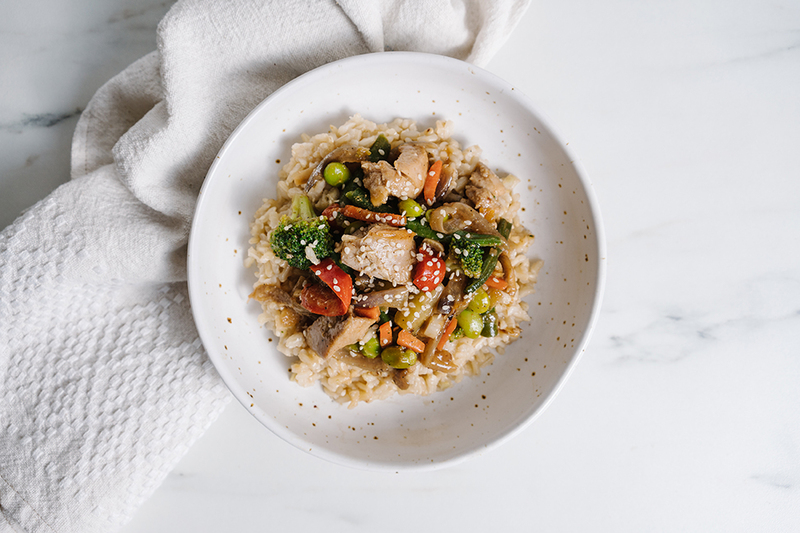 Serve over cooked rice or quinoa and sprinkled with sesame seeds. If you aren’t a curry fan, or maybe you’ve never tried it, this is the place to start. 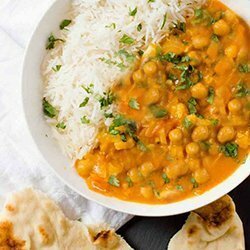 Creamy, rich and not overpowering in curry flavor. 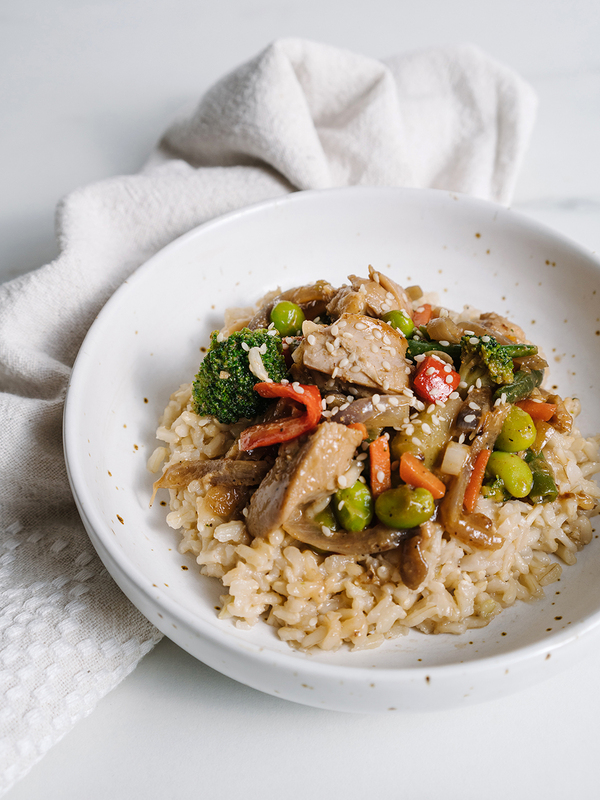 Perfect for meatless mondays though you can totally throw in some chicken if that’s your thing! Super filling and easy. Gluten free, dairy free and vegetarian. Heat oil in a large skillet over a medium high heat. Add onions and potatoes, cook, stirring occasionally until potatoes have softened (about 8 minutes). Then, add garlic, curry paste and ¼ cup of coconut milk, set aside remaining. Stir until curry is dissolved. Add chickpeas, soy sauce and remaining coconut milk. Bring to a boil for cook 3 minutes. Add tomatoes, honey and vinegar. Turn to low and Simmer 3-4 minutes. Serve over rice or quinoa and top with fresh cilantro and a side of naan or pita. If you really feel the need for meat in this dish, simply start your protein when you cook your onions. This dish is great with chicken thighs or pulled pork. Hardy with a little spice. I love this meal for a well rounded plate of delicious food. Plus, it’s so flexible to what you like! Refer to our Pantry Capsule list if you need to stock up. Fill a large pot with water, add potatoes and bring to a boil, cook for 15-20 minutes until soft. I like to keep these rustic and chunky by simply smashing and adding salt, butter/oil, milk, broth, cheese. Continuing mashing until well combined. Add the butter/oil over medium heat. 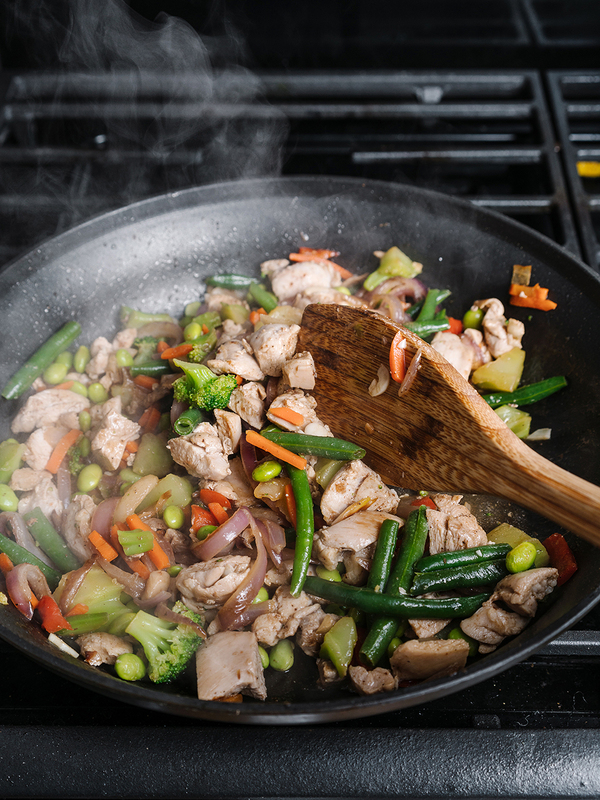 Add protein to the pan and sprinkle with seasonings. Cook through, set aside. Add the greens, garlic, vinegar and saute until soft/wilted. Serve protein and kale over mash and drizzle with hot sauce. If you’re not a kale/greens person, just warm up some frozen peas to add a little green to your dish. Warm salads are so great for dinner, they make you feel full and happy when maybe a cold salad won’t do. Either way this salad will satisfy. Gluten Free, Dairy Free & Vegetarian. Spread potatoes on a baking sheet, evenly drizzle oil over, and sprinkle salt and pepper. Roast for 20-30 minutes until cooked through. Remove kale from stem, chop and place in a large bowl. Combine dressing ingredients and whisk well. 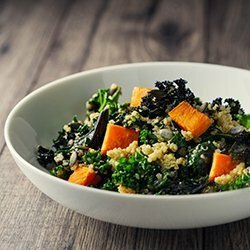 Allow sweet potatoes to cool for 5-8 minutes, then add to quinoa along with quinoa. Add nuts, dried fruit or chickpeas if using. I like to add the grains and potatoes while they are still warm. This can also just be refrigerated and served cold. Dressing is a creamy yet zingy play on honey mustard, the recipe yields 1 ½ cups and keeps for up to 2 weeks, may need to be thawed to room temp if coconut milk solidifies and shaken or re-whisked. Everything looks so good!!! Bookmarking this post too! !